Large top floor entrance living room with Restoration Hardware sectional sofas set in front of a 70'inch Plasma TV set on the floor to ceiling rock fireplace. 15 foot ceilings capitalize on the views and woodsy feel. Dining room seats 20 people with dining table and bar stools. Modern kitchen with granite counter tops and new cabinets. Massive deck connected to living room and dining room with Restoration Hardware Patio furniture the Aspen Collection of log seating from sofas to club chairs. Concrete Fire Table set in the middle of the conversation area. Restoration Hardware dining table with top of the line modern dining chairs. BBQ, large hot tub also out on this huge deck. 2nd living room with another large Flat Screen Plasma on wall, Game room with Pool table, Foosball. Bottom floor has a new Indoor Pool with rustic cedar siding lined on walls to give it that true Pool lodge feel. Large shower next to pool, another large deck just outside the pool. 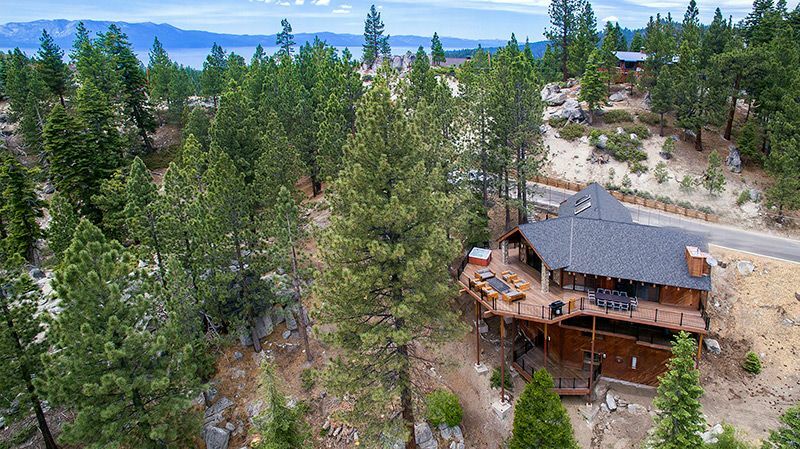 Back deck connects to some of the best hiking and biking in all of Tahoe, short walk to Heavenly Boulder Lodge. All the bedrooms are spread out on all 4 levels to provide the ultimate in privacy. All bedrooms just got new beds from a Luxury Rustic furniture company. Huge Master suite with deck, rock fireplace with 55 inch TV, oversized bathroom with walk in shower, soaking tub, double vanity. All bathrooms just got a complete high end remodel with top of the line fixtures, granite, marble and custom designed reclaimed wood vanities in most of the bathrooms. Plenty of space in this house. Indoor pool was amazing and a short walk away from a Heavenly lodge. Owner was very friendly and accommodating by allowing us to check out a few hours late. Great home for the family to enjoy time together during Thanksgiving and first snow! Kitchen, family-room and dining-room for 18 of us to be together. Within 20 minutes of Tahoe Village. Kids loved the swimming pool. Great place and great views. We had 20 people in our group and it was very comfortable. Had everything you need to make your stay pleasant. It was helpful to have a double set of washer and dryers. The only downside for us was the inconvenience of parking. With the house being able to accommodate so many people, more parking should be available. Uber worked great to leave cars at casinos but it add up using it a couple times a day. Mark was very quick to respond with questions we had. Overall we enjoyed our stay and would recommend this place to others. Numerous decks provide spectacular views of the forest and massive boulders. Guests loved the hot tub and the pool. Be sure to take a quick stroll to the cul de sac to watch the sun set over the lake. This star of this house is the deck and location. It was such a beautiful gathering place in a very private setting. We spent every evening as a family, gathered on the deck. It is nestled in the mountains and we rarely saw or heard any other people. It was the perfect home for our family reunion. Gorgeous property, just as in the pictures. Great views, amenities (linen, towels, toiletries). Well designed space and we'll maintained. Very prompt response from Mark and quick action on anything that was requested. Besides a few issues with the wifi and a couple of basic things that were missing (but were promptly attended to) I have no negatives about this property. I would highly recommend this property. Despite having 14 adults and 6 children, there was plenty of space and the communal spaces, especially the terrace with the table fireplace were excellent. By the Slopes of Heavenly, a couple miles up the hill from the South Lake Tahoe casinos.